I feel like this outfit is a perfect representation of how I want my style to be - effortless and laid back but still feminine and a little bit unique. 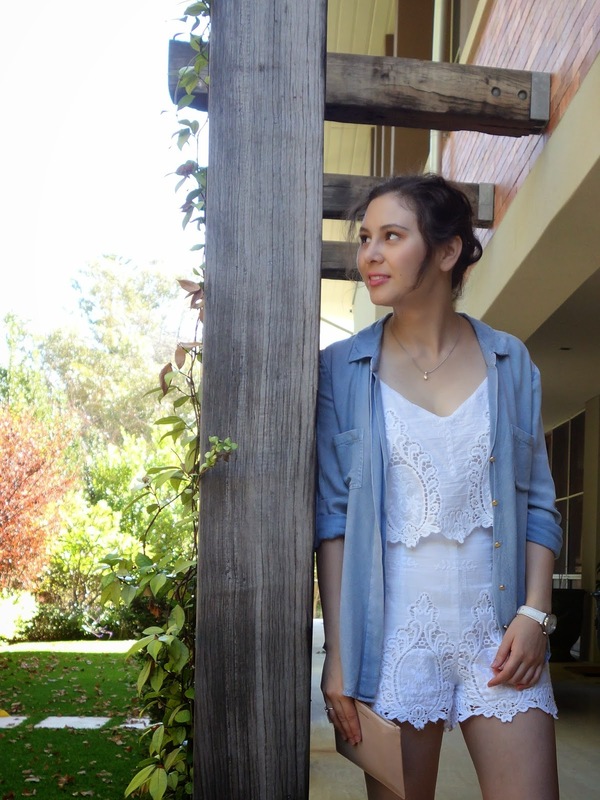 The white lace (which you know I have a soft spot for) of the playsuit is beautiful and fresh, while the chambray shirt thrown over the top gives a really relaxed vibe. There's something just so lovely about white lace - it's so feminine and soft, but the style of the playsuit keeps the whole outfit comfy and adds a bit of fun and playfulness. This might just be one of my favourite outfits I've ever shown on the blog and I'd never thought to combine these two pieces until I was playing around on Sunday morning. Most days I don't like to fuss and have multiple outfit changes (which usually happen when I'm having a "I have nothing to wear" moment and result in a horrible mess and the feeling that I've wasted a huge amount of time), but sometimes it's those days when you take the time to experiment that you end up discovering a new favourite combination. Now I'm actually thinking I should spend a little more time playing with my wardrobe - that's really how you end up getting the most use out of it and appreciating what you already own! In agreement with you that playing around with a wardrobe set up can lead to favourite combinations. It definitely makes you throw pieces together that somehow work so very well!